Last night in the War Memorial Opera, the San Francisco Opera advanced its first cycle of Richard Wagner’s Der Ring des Nibelung (the ring of the Nibelung) to its third opera, Siegfried. In many ways this is the most straightforward of the operas, even if the duration runs to four and three-quarters hours. On the surface the title character is a stock hero figure who both kills a dragon and rescues a maiden. However, in Wagner’s libretto nothing is straightforward; and in Francesca Zambello’s staging everything has an intensely dark side. 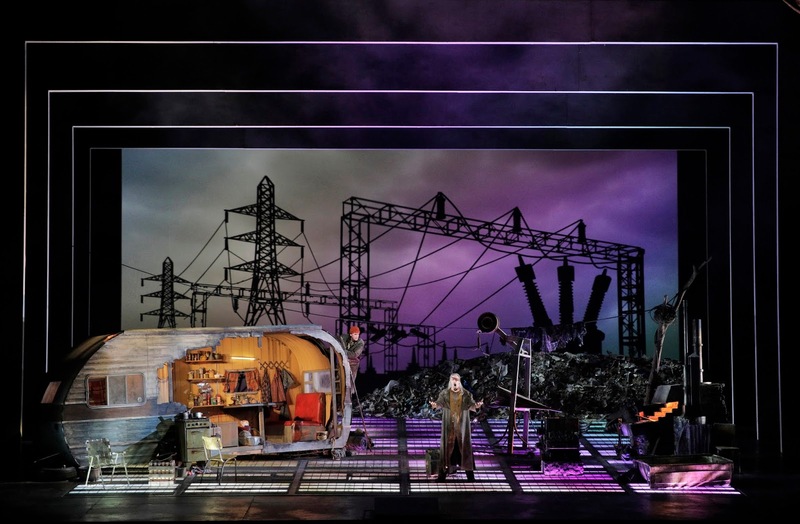 From a technical point of view, Siegfried is one of the two operas in the cycle that begins quietly. The first opera, Das Rheingold (the gold of the Rhine), begins with a low E-flat played in two different octaves by a divided bass section. The dynamic marking is piano; and that E-flat is the fundamental (pun intended for those who know about the harmonic series) pitch of the first stirrings of creation. However, instruments are steadily added to depict the planet coming into being, followed by the “gathering of the waters” into the Rhine River. In other words, as soon as the initial quietude is established, the volume proceeds to grow slowly but steadily. Siegfried, on the other hand, begins with a sinister pianissimo drum roll on the timpani. Considering that Die Walküre (the Valkyrie), the second opera, ended in the blinding light of a ring of fire, things get very dark very quickly as Siegfried begins to establish itself. However, the darkness has as much to do with Zambello’s projected images as with the action that is about to take place. In Rheingold the projections depict the emergence of order within what is initially an inchoate display of light, and that order is eventually revealed as the waters of the Rhine. In Siegfried, however, the images have become painfully explicit, all depicting different ways in which man has despoiled the natural order of the planet. If Wotan’s “Board Room” in Die Walküre has, as I have suggested, windows painted over with idealistic visions to prevent his seeing what is really happening outside of his Valhalla, then Zambello accompanies the Siegfried prologue with all of those images that Wotan would rather not see. When the first scene finally begins, we are still in the world of Justified that had been established for Hunding’s cabin in Walküre; but now all we have is a lone trailer where Mime (tenor David Cangelosi), Alberich’s henchman in Rheingold, is now raising Siegfried, the child of Siegmund and Sieglinde from Walküre. He is now a young adult; and, if you strip away the boyish looks and the golden tenor voice (sung by Daniel Brenna, making his SFO debut), it does not take much to discover that he is as much of a brute as Hunding. Anything that was bleak in Walküre has gotten much bleaker and even darker. The figure that Wagner himself conceived to be his hero is presented, instead, as an all-too-human anti-hero. The “maiden” is, of course, Brünnhilde (soprano Iréne Theorin), rescued by Siegfried from her rock surrounded by impenetrable fire by Wotan. This is the one part of Wotan’s plan that seems to go off without a hitch: Brünnhilde has been rescued by a true hero. Note that “seems to” qualifier, though. Siegfried seems to have a happily-ever-after ending; but Wagner wrote its libretto only after he had completed the libretto for Götterdämmerung. He knew that things would take a turn for the worse; and we do, too!